To find out more about the electro mechanical system above. This is an introductory page to several, non-commercial pages on antiquated totes. Although these pages specifically relate to the invention of the world's first automatic totalisator in 1913 and its subsequent development, they are an example of "mechanical computing" that existed long before the invention of the electronic computer. These were the first large-scale real-time on-line systems. 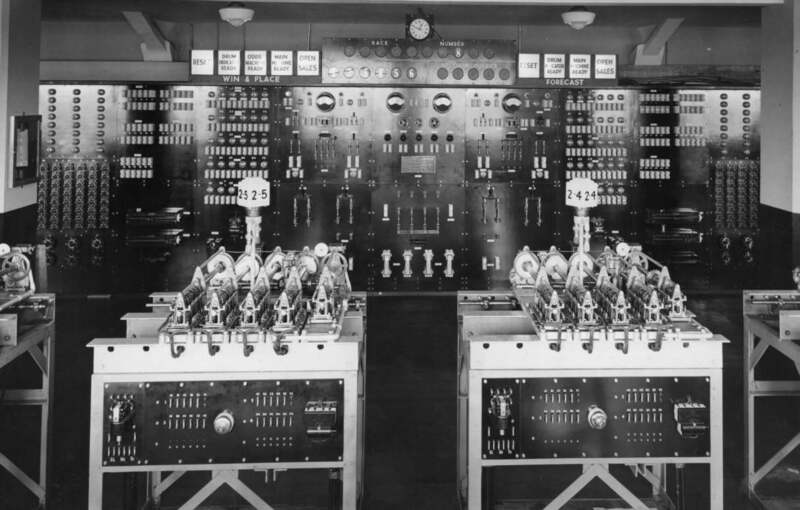 There is a school of thought, that had more been known about these early Australian totalisator systems, these would have been regarded as the first computers. Anyone these days, looking at video clips of the TIMs (Ticket Issuing Machines), that belong to these systems, working, would swear this is a computer system. Have a look at Working Julius Tote video-clips. The first one shows a TIM selling tickets. There are many analogies which make these early totalisators appeal to computer history enthusiasts. The metrics used such as sales per minute and number of terminals. These systems also had distributed points of sale and a central processing facility connected in a fashion that is reminiscent of data networks. There were input devices, the ticket issuing machines and output devices, total counters and odds indicators. Electro mechanical devices called scanners were Time Division Multiplexers which existed long before the electronic signalling methods that made this concept commonplace. In the many shaft adders in the White City system and many other systems, two of which are visible on the tables in the image below, there are devices called Storage Screws. These are a mechanical form of memory long before the concept of storage became commonplace, with the advent of Digital Computers. On the subject of many shaft adders, in the image above of the Brisbane system, which shows half of that system, there is a shaft adder in each of the windows of the frame. There was a mechanical device for adjusting the amount of commission deducted from the pool. Additionally there is information on some old electronic totalisator systems. The largest of these mechanical / electro mechanical installations that I am aware of was in White City London as shown in this image. In 1933 this was the largest tote in the world. To read about the system in the image above, have a look at the White City Totalisator. Before White City the Julius tote in Longchamps Paris was the biggest tote in the world. Have a look at the Longchamps Totalisator. To read about the way these mechanical and electro mechanical systems differed from adding machines of the time see extracts of a paper presented by George Julius to the Institution of Engineers Australia in 1920. These were multi user systems. An electro mechanical system was built and tested in Sydney Australia capable of 250,000 sales per minute from 900 terminals. George Julius referred to this system in his address to the Institution of Engineers Australia. See a newspaper reporter's description of an electro mechanical totalisator installation in Miami in 1932. The company that manufactured these mechanical and electro mechanical systems also developed the world's first electronic totalisator system, which was installed in New York. There is also some information on other electronic totalisator installations. The Brisbane system was a duplex Digital Equipment Corporation PDP11 based totalisator installed in Brisbane Australia in 1978.